Vancouver Boat Show this weekend, I will be working at the Humminbird/Minnkota booth so please drop by and say hello. If you are looking for a new fish finder or depth sounder, come see me as i will be helping Stevenston Marine in the electronics area. Should be a great show this year. STS Doug Elias is selling some fishing gear, see below for details and contact info. Fraser Canyon Sturgeon trips – I have been busy booking trips for our canyon sturgeon fishing, weekends are almost all gone. If you are wanting to fish with me in the canyon, don’t wait to book as dates are getting thin. 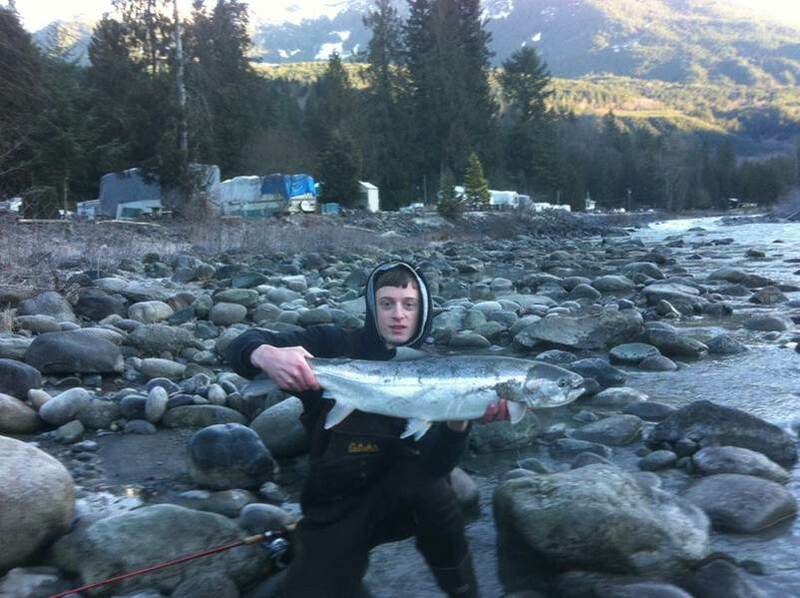 Thomas has been out pounding the Vedder and as usual, hooking lots of fish. Last weekend Thomas has a couple US clients out on the water and hooked this beauty just 10 minutes into the day. Lots of steelhead in the Vedder right now so good time to get out. Weather is quite warm for this time of year, if it keeps up the fly rods will be coming out soon. Doug & Tom just returned from Mexico, see below for Doug’s Blog. Hey Vic, well Angel and I are back to the grind after a week in Mexico. We had an awesome time relaxing and hanging with Tom and Jessica. It was a great way to spend my birthday. I have started my spring cleaning so if any one is looking for some new fishing gear I have some great deals on spinning rod combos and 4 TLD 20 lever drags spooled with Berkley 130# Big Game. You can reach me at doug.elias if you are interested. I haven’t had a chance to get out much yet but I will keep you posted once the rods are out. Previous PostJan 23 Fishing ReportNext PostFeb 13 update.